During an official ceremony held today at 14h00 at the Centre for Humanitarian Dialogue’s (HD) in Geneva, Switzerland, HD’s Executive Director, Dr David Harland, confirmed that the organisation had received ETA’s official final declaration that the group had disbanded forever. This final declaration – which HD is certain is official and authentic – was sent to HD in four languages (Basque, Spanish, French and English), signed and stamped by ETA, and dated 3 May 2018. It was accompanied by a letter to HD from the group explaining its decision. In its letter, ETA stated that it had “decided to end its 60 years of existence” and that this decision “had been taken by the entire membership of the organization”. In its final official statement, the group also indicated that as a result of this decision, it had “completely dismantled all of its structures”, “put an end to all its political activity, and would “no longer express political positions, promote initiatives or interact with other actors”. ETA’s official announcement made public today by HD puts an end to almost 60 years of violent confrontation which has caused the death of hundreds of people, wounded thousands of others, deeply polarizing Spain, parts of southern France and the Basque regions, tearing communities apart, disrupting people’s lives, and leaving society deeply hurt. ETA’s announcement also puts an end to 15 years of efforts by HD to end the group’s violence. HD has been very discreetly involved in helping to bring a final end to ETA and its armed campaign since 2004 when it was first requested by the then Spanish government and ETA to initiate talks between them to seek lasting peace. Following the breakdown of the talks in 2007, discreet initiatives were undertaken to renew efforts towards peace. In 2011, ETA declared a permanent end to armed violence, and in 2017, it unilaterally disarmed, handing over more than 3.5 tons of weapons and explosives. On 20 April 2018, the group issued a declaration recognizing the harm it had caused through its armed actions, and pledging to support reconciliation efforts. Today, in what is its final step, ETA announced its complete disbandment and permanent disappearance. ETA’s announcement is unprecedented. It is the first time in history that a major armed movement has unilaterally and unconditionally stopped armed violence, fully disarmed, and then disbanded itself and disappeared forever. HD hopes that, through the discreet role it played over the last 15 years, it has been able to contribute to today’s announcement. As the world’s largest private diplomacy organisation, HD exists to reduce human suffering and end conflicts wherever that is possible. It is currently involved in about 40 peace or dialogue initiatives around the world. 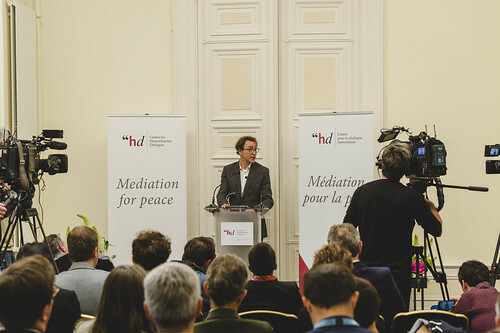 As a Swiss foundation, HD also feels that its mission and its work represent the best of what Switzerland symbolizes and supports – the quest for peace wherever that is possible. HD is thus pleased that ETA’s final declaration today was made in Geneva. HD also commends the courage and the strength of all of those – governments, organisations and individuals – who have led the way towards peace over the years. ETA’s announcement demonstrates that finding a peaceful resolution to conflict is possible, however long this may take. While a long road lies ahead towards reconciliation and the healing of wounds caused by years of violence, HD hopes that ETA’s announcement represents yet another step towards long-lasting peace for the Basque people. The ETA official declaration is available in four languages here: Basque, Spanish, English, French. To access Dr David Harland’s full statement, please follow this link. You may also access HD Board Member, Ambassador Raymond Loretan’s statement here.